So that H.P. Lovecraft. What is his deal? What messed him up so badly that he created the creatures inhabiting The Dunwich Horror and The Call of Cthulhu? And why inflict them on us? I don't think I'll sleep well tonight. I downloaded The Dark Worlds of H.P. 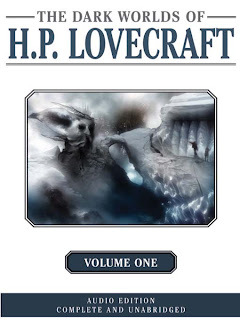 Lovecraft (Volume One) from the library today and listened to it all in one go. Why? I couldn't stop listening. Right from the beginning of The Dunwich Horror I was drawn in. Lovecraft takes great pains to create an atmosphere for horror. The dilapidated houses, the spooky scenery, and the sinister townspeople are described in detail even before any of the main characters are revealed. The events leading up to the birth of Wilbur Whateley foretell that this isn't an ordinary boy and as he grows older it becomes apparent to all who meet him. There are strange goings on at the Whateley place, weird noises and mysterious sights and smells. Throughout the story the narrator eludes to the Dunwich Horror of 1928. As that date draws nearer in the telling, more and more bizarre events occur, finally culminating in a battle between good and evil. The Call of Cthulhu deals with a creature from another dimension. In this story, the nephew of Professor Angell, who died under suspicious circumstances, reveals what he has found in his uncle's papers. Professor Angell has been obsessed with a creature called Cthulhu, a creature that has lain asleep under the earth since before man. Cthulthu sleeps but is not silent. Through dreams it calls out to men to remember and worship it. The professor collected unrelated stories of the Cthulhu from three separate sources. What he discovers is so frightening he fears for the fate of mankind. Lovecraft suffered from night terrors. If these were the things that floated around in his mind at night, I'm not surprised. Every word is crafted to frighten the reader. The sense of impending doom builds, especially in The Dunwich Horror, to a grotesque climax. At the same time, it's an old-timey tale. I suspect no one had read anything like this before the 1920s. I can see how he would inspire modern writers like Stephen King. Be warned though, the guy was a big ole racist and that comes through in his descriptions of certain people. If you can put that aside and enjoy old fashioned horror stories, you'll enjoy this audio production. About the audio: Both stories are narrated by Wayne June who certainly has a voice for horror. His husky deep voice added to the atmospheric experience of listening to these creepy tales. At one point, Wilbur speaks and Mr June's interpretation raised the hair on my arms. Recommended for fans of horror. I've never read Lovecraft, but I was watching a podcast interview with Stephen King the other night, and apparently a Lovecraft book he found in his childhood is one of the elements that brought him to horror writing. Very interesting stuff. Looking forward to trying some of Lovecraft's work myself. Oooh, good idea, having the Lovecraft stories read to me. No skipping ahead that way. He is pretty scary. I'm pretty sure the racist/sexist stuff is what's going to get me the most though. I had planned to read Lovecraft last year, but it never happened. Maybe this year! Andi- I can see Lovecraft in King's work. Carrie- The Dunwich Horror isn't as bad as Cthulhu. Kelly- I hadn't really planned on it but glad I did.